Everyone knows you can find frogs in a wetland, but did you know you could find furry mammals too? Wisconsin’s wetlands provide important habitat for a variety of animals, including mink. Learn about mink with the help of Kristi Sullivan, author of the below article. The mink is a semi-aquatic member of the Mustelidae family. Its relatives include weasels, martens, fishers, fishers, wolverines, badgers, and otters. Adult male mink average two feet in length, including an 8-inch tail. They weigh 1.5 to 2 pounds. 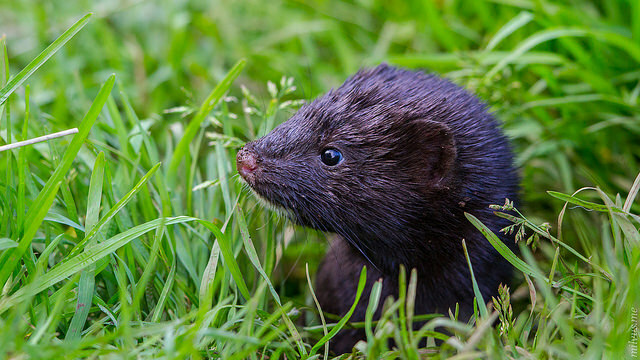 Female mink are slightly smaller than males and weigh up to half a pound less. Like weasels, the mink has short legs, a 6-8 inch bushy tail, a long neck and body, short head, and a pointed muzzle. A mink’s coat is thick, full and soft. The fur is dark chocolate brown on the back, blending into a slightly lighter shade on the belly. A distinguishing characteristic of mink is a small, white patch of fur on the chin. Mink are very active and inquisitive animals, with a keen sense of smell and sight. They are most active at night and in early morning. On land, they move with a quick, bounding lope, which they can continue for miles. This characteristic lope leaves paired tracks, which stand out in the winter snow along stream banks and beaver ponds. Mink are at home in the water as well, and they swim and dive with ease. Mink occupy a wide variety of wetland habitats but most commonly are found along streams and beaver dams like this one in undeveloped rural areas. Mink occupy a wide variety of wetland habitats but most commonly are found along streams and beaver dams in undeveloped rural areas. Here, they can be seen traveling from one stream bank to the other, investigating nearly every hole, crack, crevice and overhang that may hide a potential meal. Mink are best suited for areas with very good water quality, because these waters will hold the greatest concentrations and varieties of prey. Like most mustelids, they are agile and fierce fighters, killing prey with a hard bite to the back of the skull. Prey includes muskrats, mice, rabbits, shrews, fish, frogs, crayfish, insects, snakes, waterfowl, and land birds. Mink are opportunists, feeding on whatever is most abundant or most easily caught. They occasionally kill more than they can eat and will cache carcasses in the winter and revisit them to feed. In turn, mink are prey for foxes, bobcats and great horned owls. In the wild, mink typically live to be two or three years old. To find enough prey, males require a home range up to three square miles, while females use a much smaller range. Individual territories overlap, and several animals in succession may use the same den. One mink will have several dens along its hunting route. They den in abandoned woodchuck tunnels, hollow logs, vacant muskrat lodges, holes in stone piles and beneath large tree roots. Dens are usually near water and may have more than one entrance. Mink line their nests with dried grass, leaves and feathers. Overall habitat requirements for mink include an abundant food supply, permanent water, and undeveloped shores. Woodland owners who would like to enhance habitat for mink can focus on protecting water quality, and limiting the use of pesticides on lands adjacent to water. High quality, pesticide-free water improves insect populations, which in turn provide food for animals that mink prey upon, like frogs. Woodland owners can also create riparian and wetland buffers, and protect existing buffers from development. 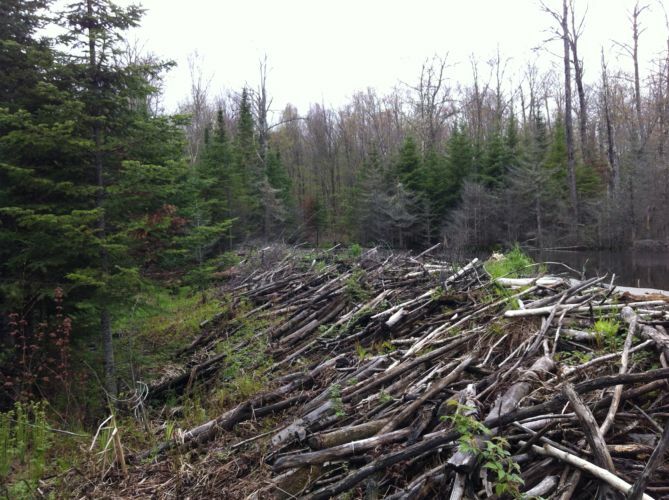 Brush piles can be created to serve as denning sites, if naturally occurring dens are not available. A few large trees felled and left on the ground can provide future logs for feeding and denning. Dead wood protruding into the water will provide cover for prey items as well. This story is by Kristi Sullivan. Kristi Sullivan is Director of the New York Master Naturalist Program, part of the Cornell Cooperative Extension in the Department of Natural Resources at Cornell University. 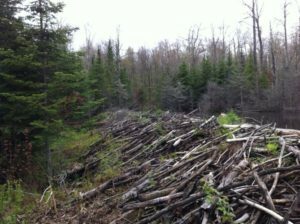 This story originally appeared in the New York Forest Owners Association magazine, and is printed here as published in Wisconsin Woodlands magazine, Spring 2017 issue.